Psalm 121:8 The LORD keeps watch over you as you come and go, both now and forever. The sound of screeching tires about two feet from me recently got me to thinking: I could have been hit by a car…my life could have been over! I had just stepped onto the pavement after crossing a major street when a car came barreling out of nowhere, and made a screeching halt just under the red light signal. 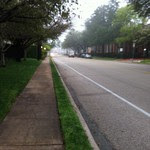 This startled me – what if I had slowed my pace while crossing? I would more than likely be dead. I share this story because none of us are guaranteed a specific number of days on earth. · Are you making wise use of your time? · If your life was to end, would those who love you say that you accomplished your goals and God-given purpose? · Have you taken time to love people, to make your life count and to use your abilities and gifts in service to those who need you the most? · Have you made a difference as a disciple of Jesus Christ? God help me live a full life that will make you proud of me. And, keep all of us safe from harm. In the powerful name of Jesus Christ - Amen!